This resource features the general description of an underground temple complex. The temple belongs to the Bloody Petal Cult. 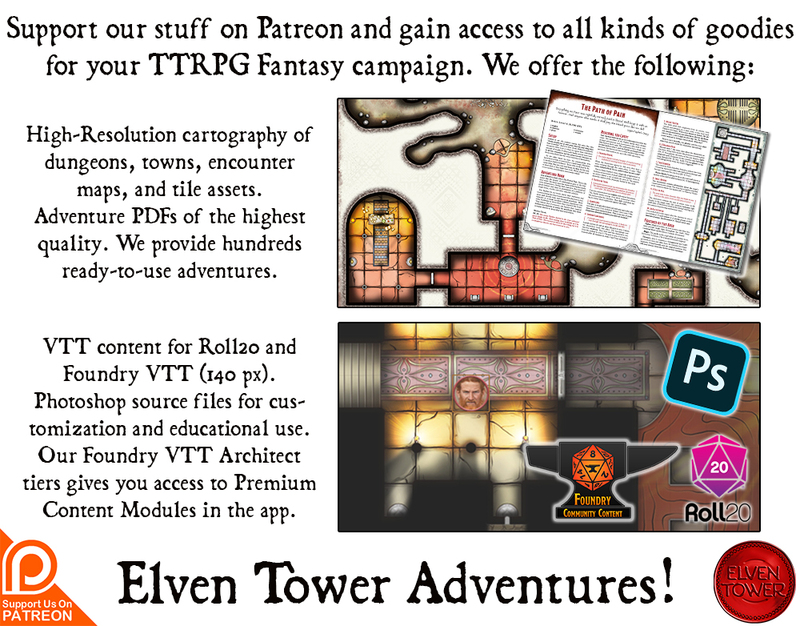 It includes adventure ideas that are appropriate for low-level (Levels 1 to 5) adventuring parties and it is optimized for level 5 parties. Challenge Rating (CR) is calculated using a party of four as the model. A white rose is a strong symbol for peace, weakness, and purity. Very few people would oppose that view, and that is why the Bloody Petal Cult takes it not only as his symbol but also as their main substrate for the cult ceremonies and rituals. In the Bloody Petal Cult, a white rose is a symbol that represents the common man. The common man is uneducated and unaware of The Flowery Crown, which is the divine being the cult worships. The common man can be anyone uninitiated in the cult. City folk, farmers, nobles, and even children are considered common, the representation of the white rose. Cult members see them as a lower version of themselves; inferior creatures whose primary descriptors are weakness and purity. The real being behind everything is actually a demon lord known as Fraz-Urb’luu. He is known as the Prince of Deception because he often hides his intention behind layers and layers of false truths and lies. In the Bloody Petal cult, Fraz-Urb’luu is the puppet master that controls everything. The Flowery Crown is a fake deity. There is no cult, the chants are old chants for a forgotten god, and the ritual is just an invented performance with no backing. Fraz-Urb’luu uses his demonic power and influence to control the head priests of the cult. He then uses the cult as an organization to further his own goals. Fraz-Urb’luu’s involvement in the cult is such a well guarded secret that no one even suspects it. Even the high priests are unaware of this fact. Things have gotten somewhat more complicated in the last few days. Two cultists kidnapped Prince Roinard and will sacrifice him in a ritual ceremony during the summer solstice. This is critical because Prince Roinard is the king’s only son. There are two princesses but their marriages are already arranged for political reasons. The king is desperate and willing to pay any amount of gold or reward if his son is brought back alive and unharmed. Fraz-Urb’luu’s endgame is simple. If Prince Roinard dies, the king will not have another son. The king is not that old, but Fraz-Urb’luu arranged for the queen to drink a poisonous substance five years ago that made her sterile. The king’s eldest daughter, Princess Gabrielle will be wed to a Baron from a neighboring province. This baron is particularly susceptible to Fraz-Urb’luu’s influence. Fraz-Urb’luu has controlled the baron’s ancestry for the past six generations, breeding them to be weak against his mental control. If the demon lord’s plan succeeds, in less than twenty years the king will pass away. His daughter will become Queen Gabrielle, who is not a particularly authoritative person, and the Baron will become the Consort Prince. Fraz-Urb’luu’s influence on the kingdom will be greatly improved. A long-term goal includes Queen Gabrielle’s and the Baron’s grandchildren, which will inherit the Baron’s mental weakness. Fraz-Urb’luu’s plan will be complete when the king itself is his mental servant. He is immortal, so he has no trouble orchestrating this for generations. Prince Roinard is missing and the king is offering anything to bring him back. The only information available is that the local blood worshipping cult is guilty. There is no information available on the cult’s hideout location. The adventurers will have to make use of their own abilities to pinpoint the location of the temple. It is located underground. There are two entrances which are hidden in the sewers tunnels under the city. An easy way to locate it would be to ask around town until they find a member of the cult, and then follow him down into the sewers undetected. The cultists are not easily scared so they may not reveal the temple’s location even under severe duress, but the DM is free to determine whether a particularly creative interrogation method might produce the information they are looking for. The south entrance is located in one of the main sewers lines under the city. It is always guarded by two cultists (MM, page 345) outside and one cult fanatic (MM, page 345) inside. This is the largest chamber in the complex. The walls are decorated with murals and bas-reliefs of the Flowery Crown. There are graphical depictions of the bloody petal ceremony too. There are eight benches in the room facing a tabernacle surrounded by two braziers. The head priest often gives lectures and assigns labors to the different members of their community. There is a pond on the west wall with unholy water. 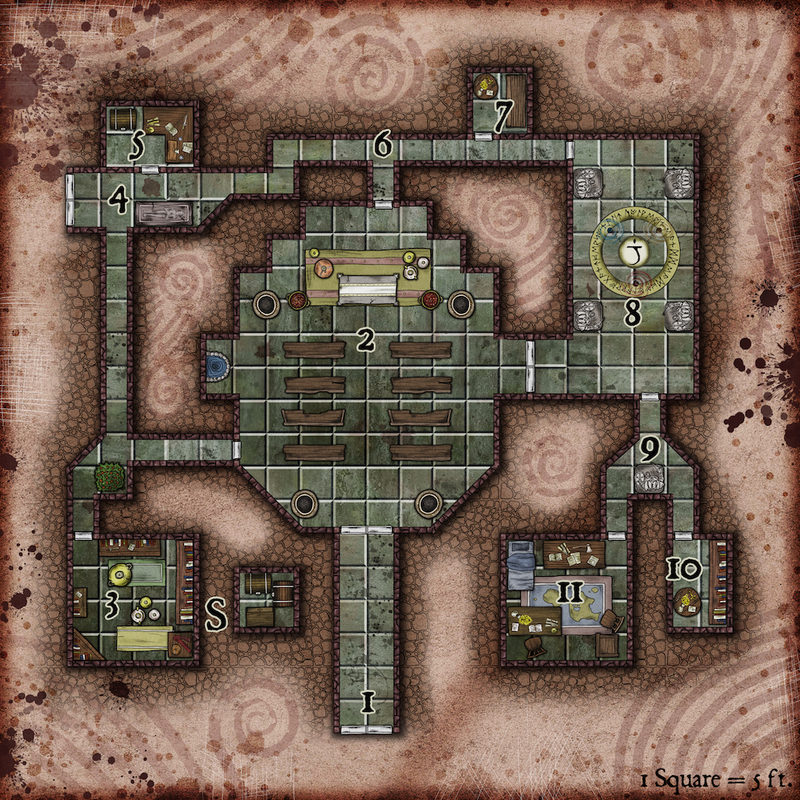 At any moment, there are 2d6 cultists (MM, page 345) in this location performing cleaning labors or praying. If the head priest is around when the adventurers arrive, he flees to Area 8 while the cultists deal with the invaders. There are four different bookshelves in the library. They contain an assortment of history books, arcane books, and cult texts related to the Flowery Crown. There is a cursed golden vase in the middle of the room. The cultists know about it and avoid it. If an adventurer removes the top lid, an angry ghost (MM, page 147) emerges and attacks. The ghost cannot be reasoned with. If a character decides to make a religious analysis of the Bloody Petal Cult by examining the available texts in the library, there is a chance he may discover the hoax. The character must make a DC 20 Wisdom (Religion) check to determine that the cult and its ritual are fake reconstructions that take elements from several other belief systems. There is a secret passage behind the bookshelf on the east wall. A part of the bookshelf moves to one side if the correct book is pulled. A character might find about this if he makes a DC 14 Wisdom (Investigation) check looking for traps or secret mechanisms. The short passage leads to a secret room with two chests and a small wardrobe. The wardrobe is full of tunics for head priests. The two chests are full of gold and silver coin. The west entrance is located in a seldom explored part of the sewers. For that reason there is only one cultist (MM, page 345) on guard duty. Other members of the cult do not use this entrance often because it takes longer to reach the surface if you go out this way. There is a sarcophagus right inside the temple complex. The sarcophagus contains a hungry ghast (MM, page 148). It emerges if the cultist on guard calls on it to do so. It also emerges if it hears sounds of fighting. There is an L-shaped desk with a good amount of paperwork, documents, two deeds, and a few gold coins. The chest in the northwest corner is a mimic (MM, page 220) waiting patiently for its next meal. The cultists keep the creature here for protection and feed it from time to time. There is a trap in the square where the paths intersect. A hidden pressure plate on the floor triggers ten spears that emerge from the floor at high speed in variable angles. An adventurer with a passive Perception score of 14 or higher notices a slight discoloration in the stone tile that suggests that it was placed after the rest of the floor. If a creature steps on the marked square, it must make a DC 15 Dexterity saving throw, taking 17 (4d8) piercing damage on a failed save, or half as much on a passed save. If the pressure plate is spotted, bypassing the trap is a simple task. Any character may walk through the marked square at half speed to avoid stepping on the pressure plate. The wooden door that leads to this room is reinforced with steel beams on the inside of it. The lock is of good quality. An adventurer can try to pick the lock by making a DC 16 Dexterity check using Thieves Tools. A fail triggers a swinging axe trap. The target must make a DC 15 Dexterity saving throw, taking 10 (3d6) slashing damage on a failed save, or half as much on a passed save. Personal effects and other objects of value retrieved from kidnapped people end up here. There is a sack of gold coins on the roundtable, plus the deed to a small section of the docks. The center of the incantation circle is where countless people have lost their lives to continue feeding the cult beliefs in the Flowery Crown. If the party is here to rescue Prince Roinard, they find the prince tied and gagged on the floor, in the center of the incantation circle. The head priest (Mage, MM, page 347) is standing before him with a long golden knife in his hand. 2d6 cultists (MM, page 345) sit in a circle around the head priest and the prince, chanting. They will stop their chant and fight if attacked. Additionally, one of the statues in the room is a loyal gargoyle (MM, page 140, if reveals its presence if the head priest is attacked. If the adventurers manage to kill the head priest, the rest of the cultists disband and run for their lives. The statue that stands where the hallway divides speaks to any who approaches. It moves and behaves like a real gargoyle but it is only an enchanted statue with a semblance of life. It cannot move from its pedestal. It is always still, but a permanent illusion effect makes it appear as if it moved on its own. It may pose riddles, or threaten to attack the party but it is all a ruse. The door to this library is reinforced and trapped, just like the door to Area 7. There is a bookshelf and a table inside. Only the head priest can access this room and examine the book therein. The books describe the small minutiae of the ceremonies and chants. They are considered to be holy texts, irreplaceable, and the cult’s legacy. The head priest is the only cultist that sleeps in the temple. Other members of the community go back to their homes during the day. They exit the sewers in small groups so as to not raise the alarm. There is an exquisite rug on the floor with a world map embroidered to it. There is also a desk, a wooden crate, and the priest’s bed. The head priest keeps an archive of past correspondence in the desk’s drawer. If it were recovered, it may reveal the identity of other head priests of the Bloody Petal Cult in other cities. 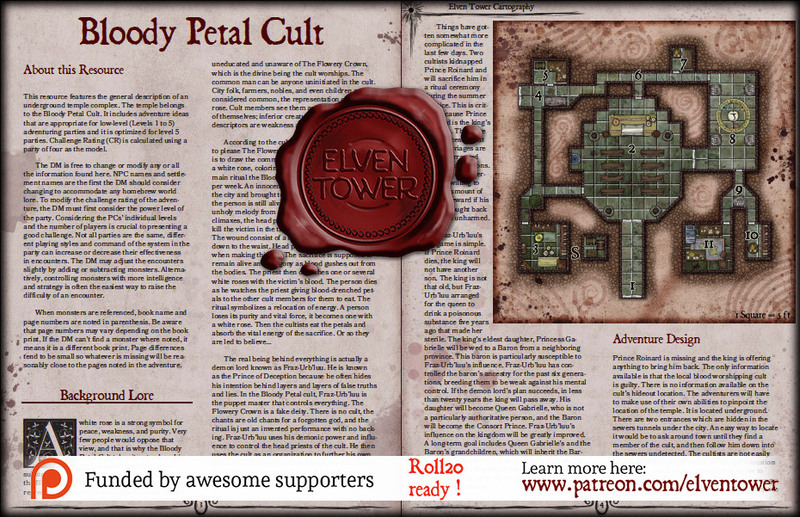 These are the general features of the Bloody Petal Cult temple. The place is underground. Both entrances are reachable from the sewers in the city. Terrain. Green-tinted stone tiles make the floor even and stable. The tiles are made from a type of granite that is common to the area. Light. There are torch sconces on the walls every ten feet in chambers and hallways. They are only turned on when the area is in use. Otherwise, the location is considered to be dimly lit. Smells and Sounds. Areas 1, 4, and 5 still carry the sewers smell. The rest of the underground complex is impregnated with the smell of incense and burned wax. The place is silent except when the cult performs a ritual. The many cult members sing anthems in lost languages.